The order process is super easy and self-explanatory. Click on the link above and open it in a new browser window. If you don’t know how to do this, open a new browser window, then copy and paste the link into it. This way, you can submit your order in one window while reading the instructions in another one. On the page, scroll down to the Webinar you want to order. Click the Add to cart button(s) in the lower right corner. See an example for ‘The Gene Keys in 9 Centers of the Bodygraph’ Webinar below. It works just the same for all other products. As soon as you clicked the Add to cart button, the cart is accessible in the black stripe on the upper end of your browser window. Click to show cart, then click Checkout. No coupon code required. See below. 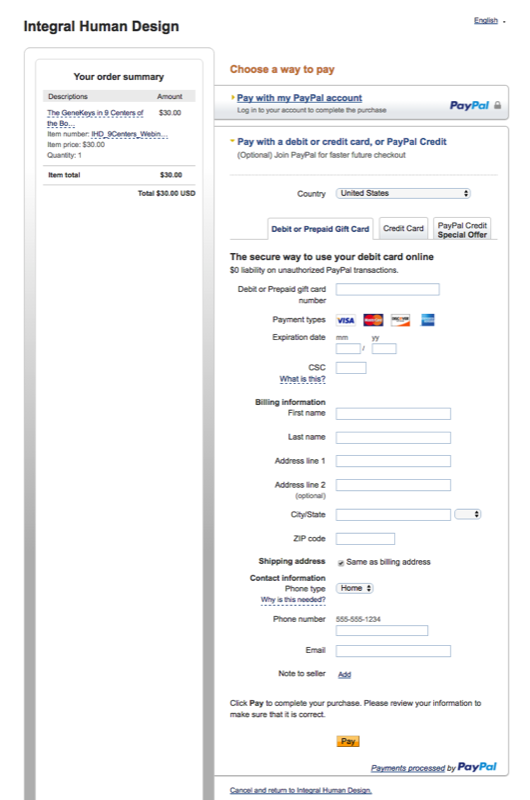 Click Agree to be re-directed to PayPal, our payment system. You can pay with PayPal or with your credit or debit card. Submit your payment through PayPal. First, choose a way to pay. If you have a PayPal account, you are all familiar with the procedure. 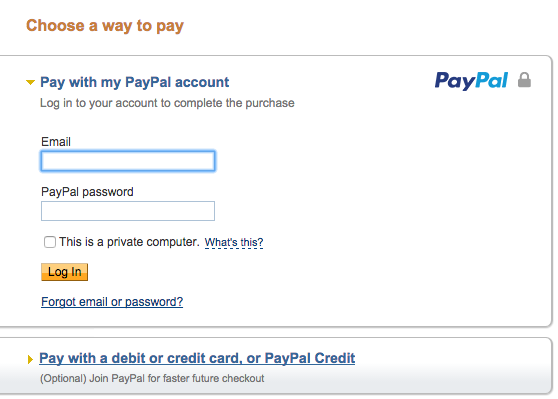 If you don’t have a PayPal account, click on Pay with a credit or debit card (see below). If you clicked Pay with a credit or debit card, fill in your details and click Pay. If you ordered a Webinar, you are done. You will receive an email with the download link within minutes. If you ordered an Evaluation using the old shopping cart (because you wanted to pay directly in US$), please click the ‘Return to Merchant’ button or the ‘Return to IntegralHumanDesign’ link on the PayPal confirmation page (after submitting your payment). You will then be automatically re-directed to a form where you can provide your personal details for the Evaluation(s). Need support? Email us at office@integralhumandesign.net. We are happy to help.